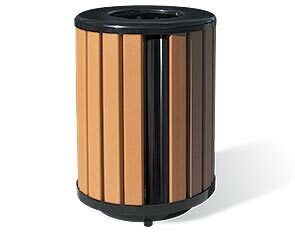 Crafted with commercial grade materials and a contemporary design approach, these innovative Richmond Collection trash receptacles provide the style and durability that unmistakably helps in keeping properties professional and litter-free. Supported by an ultra-sturdy powder-coated steel frame, the receptacle base is comprised of slatted recycled plastic and oval-shaped steel tube accents, all smartly tied together with upper and lower steel bands. The inset base support is specifically engineered with tabbed footings allowing for semi-permanent surface mount installation. with Flat Top - 38-1/2"H x 27"Dia. with Rain Bonnet - 49-1/2"H x 27"Dia. with Ash Urn - 49-1/2"H x 27"Dia. Built ready for a vast array of applications, these 32 gallon capacity receptacles include a rigid plastic liner and are available in three lid options; Flat Top Lid, Rain Bonnet and Ash Urn—each are appointed with a user-friendly 8"Dia. disposal opening.